Looks like the best GFS charts in years for England this Monday with nearly 3000 CAPE and LIs of -7 for that region covering a large area in the form of a Spanish Plume-type set up. This is a early heads up to great storm potential, and possibly the finest storms in years. I won't be here over the weekend so could someone please post a convective outlook on Sun night when it's available, thanks. 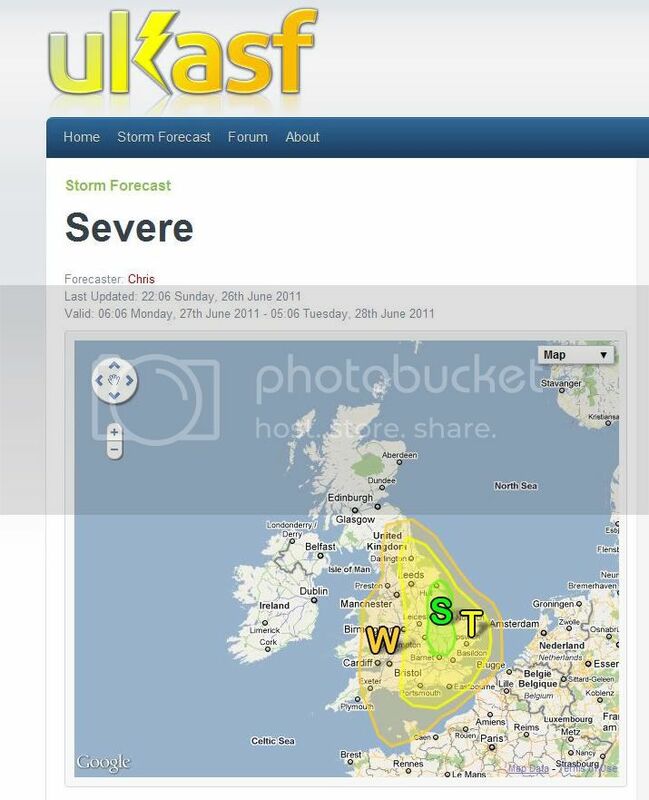 Here's that chart from Netweather GFS, it will get downgraded a bit however it still looks insane! Incredible looking charts could this be the big of the year lets hope so. Martin I will post CFS chart Monday, looks as if Ipswich & Norwich are currently seeing very frequent sferics. I have changed the threat title to taken in Tue's potential, there's also a risk of storms on Sunday too but keep that for another thread. It only gets better, seriously thinking on travelling east on Monday to capture any action even though it is some way from home but less miles than Cornwall so that’s a bonus. Travailing North tomorrow around Yorkshire / Humberside. Martin I will post any developments over the weekend if things change and if you want to PM your mobile number I can also text you if things start to develop sooner, I have access to Netweather charts and 5min radar. Absolutely mouthwatering charts!! Crazy crazy figures those with explosive convective potential, yes they will be downgraded (downgraded on the 18z run) but nice to see this showing up, if nothing else but to get a bit of banter going-i will definitely be watching developments over the weekend. I'll get the car tanked up and photo gear etc. ready Sunday night- will keep a very close eye on this so keep the info. going chaps. Tuesday looks like it will move westwards too ,much nearer to the Midland and Gloucestershire. Still on course for Monday!! Checked the above chart at 2245 Sunday and that high CAPE area has moved west to my doorstep-the high values being just east of me. We're due TS's from 7.00pm onwards into late evening. I'll be close to Southampton from 10.30am to 1.30 pm and then drive home so hopefully will see some storm initiation en-rout travelling through the south central region to south west Midlands. A level one threat has been issued across the SE UK mainly for large hail, damaging wind gusts, and tornadoes. A high-amplitude upper flow pattern exists over Europe, with a longwave trough setting up over the eastern Atlantic. Another long-wave trough is present over eastern Europe and will close off into a cut-off cyclone on Monday. At low levels ... the eastern Atlantic trough supports advection of warm/moist air into western and central parts of Europe, as well as the northward expansion of an EML plume atop this warm/moist air mass. The SE European trough is accompanied by a rather intense SFC low, but elsewhere rather quiescent synoptic-scale surface conditions prevail. It seems that some instability will develop in the pre-frontal air mass across the southern British Isles and western continental Europe as the mid-level lapse rates increase in response to the northward spreading EML. The GFS CAPE values are not to be trusted given suspected problems in the surface-flux scheme that overestimates the diurnal latent-heat flux cycle. ECMWF shows that some 500 - 1000 J/kg of CAPE will develop over the SE British Isles and up to 2000 J/kg over France and the Benelux countries, which seems to be more reasonable than what GFS is advertising. First storms should develop over the SE British Isles amidst the 850 hPa thermal gradient, probably in the afternoon hours, gradually increasing in coverage as the day/evening progresses. The activity should migrate across the Channel region and expand southwards during the night, when the convection will likely become slightly elevated. It seems that upscale growth into one or more elevated MCSs may occur, affecting extreme N France and the Benelux countries early Tuesday morning. 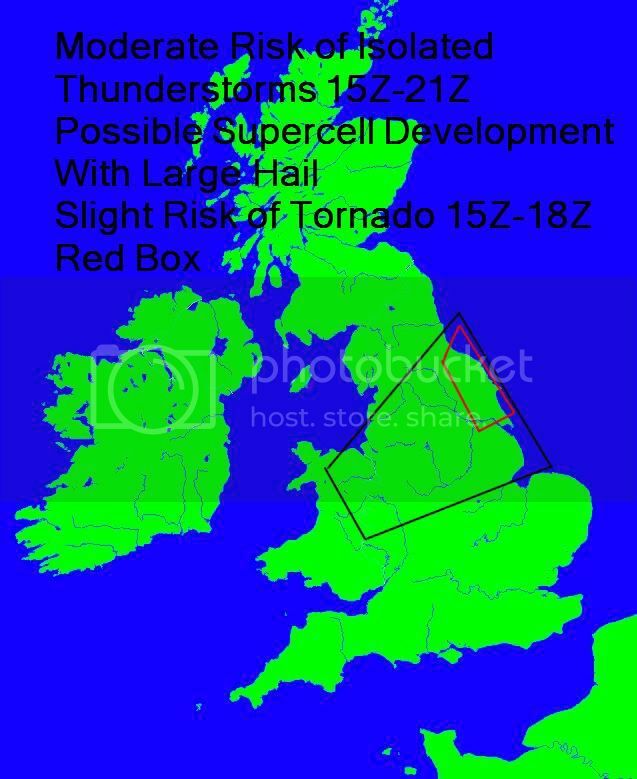 The severe threat with the convection over the British Isles in the afternoon and evening hours should be dominated by well-organized multicells and supercells given DLS of about 20 m/s (increasing from about 15 m/s over the extreme SE parts of the UK to over 25 m/s over the central portions of the UK) and rather strong LLS (exceeding 10 m/s over the extreme SE UK). However ... CAPE should be weakest where shear is strongest, and vice versa. Also, the LLS maximum is expected where DLS is weakest. Despite these somewhat negative factors, it seems that isolated large hail and damaging winds will occur, and perhaps also a brief tornado or two. At this time, a LVL1 threat seems to be sufficient, though an upgrade to LVL2 may be required if the CAPE and shear fields become aligned more favorably, or if CAPE proves to be higher than currently anticipated. Currently some broad variation within the models ATM. Though for me based on the GFS I see a prime region for strong convection as per map below. In fact based on the overlay of strong CAPE values to vertical shear we will have the basis for supercell development. I am further encouraged by a very dry incursion within the mid levels which is likely to increase lapse rates quite dramatically. As Chris mentioned, vertical shear should sustain an isolated storm long enough for large hail to build within the updraft. Some strong convective gusts are possible though likely to be non severe! My attention is primarily drawn to a small zone where low level direction shear turns a full 90 deg (red box). The convergence closer to the coast could well trigger a tornado or two. Winds above 850 mb look fairly straight lined so not sure if any mesocyclone development will extend upwards into the mid level efficiently. The larger picture may well see some minor convective storms develop across other parts of the UK though dynamic lift looks rather weak for anything substantial. Hence my focus within the convective box below! Severe area: (a portion of E England)...I will stress before I begin, the risk of afternoon thunderstorm development is particularly low, however if any do develop they could become severe...Some of the warmest surface temperatures will be located in this area upper 20s to near 30C possible. Along with dew-points in the low 20s this could produce CAPE values in the region of 2000j/kg. Deep layer shear values will be near 35-40kts in this region, enough to separate updraft/downdraft regions and potentially produce a few mesocylones/supercell thunderstorm IF afternoon, surface based convection can develop. 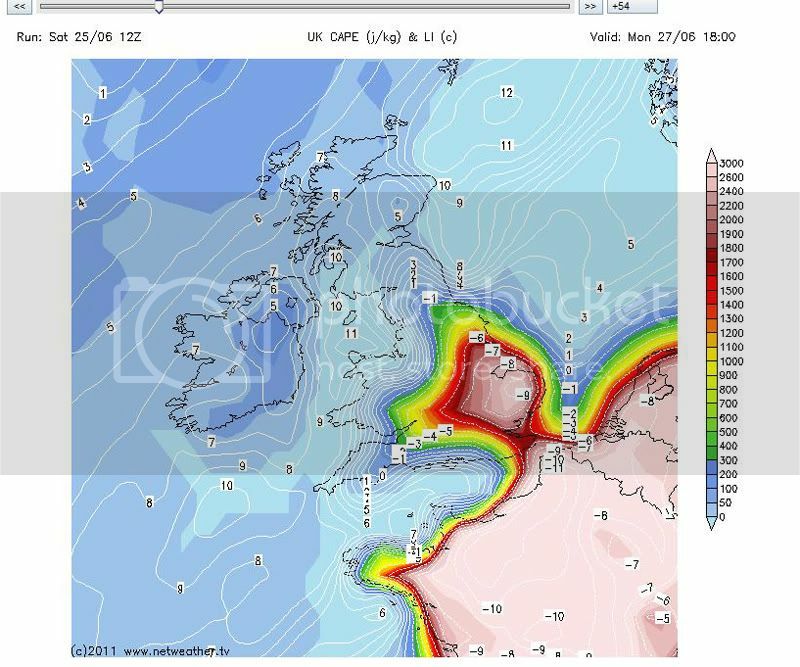 Cap strength will likely be fairly strong as upper ridge is slow to clear the east of England. This will produce a dry/warm layer separating the hot humid surface air from the cooling upper level air above it. At the moment, both NAE and GFS are reluctant to break the cap and produce this surface based convection, so chances of it occurring are in the 20% realm, however if they do develop they would do so quickly and produce severe weather with the potential of large hail (up to 2.5cm), strong gusty winds, particularly given the drier mid-layers, frequent CGs and potentially a few isolated tornadoes. - Low level shear is in the range of 15-20kts and SSE to SSW surface convergence is possible in this region, indicated by the 12z NAE. Thunderstorm Area: (S and E England) This area will be monitored for mid-level instability thunderstorms which are likely to develop across France during the afternoon and move northward across the area during the evening and overnight. Lightning (mostly in cloud), gusty winds and some hail could be associated with these elevated storm even into Tuesday morning in East Anglia and Eastern England.